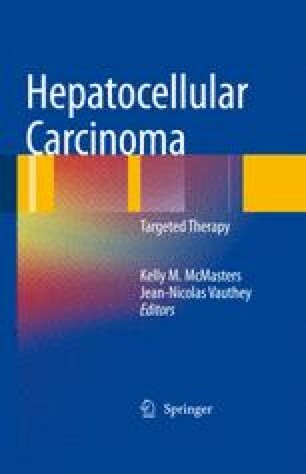 This chapter discusses transarterial chemoembolization (TACE), which has become the mainstay of treatment for unresectable hepatocellular carcinoma (HCC). Its success is attributable to the ability to deliver high-dose chemotherapy into the tumor vascular bed. The addition of emulsifying agents (i.e., lipiodol) and/or particles to the chemotherapy slows down the blood flow through the tumor blood supply and increases the chemotherapy residence time. Recent technological advances such as drug eluting beads further increase the intra-tumoral drug concentration and residence time, while limiting the plasma concentration. This results in increased tumoricidal effect and less systemic toxicity related to TACE. The survival benefit from TACE has been repeatedly shown to be more than double that of supportive care or systemic chemotherapy alone, with less toxicity. The approval of targeted agents for the treatment of unresectable HCC, such as Sorafenib, can have synergistic effect with TACE on survival. Combination treatments that include TACE, ablation, and systemic maintenance chemotherapy will soon become the standard of care for patients with unresectable HCC. These treatments will also likely result in downsizing of many previously unresectable or non-transplantable patients, a likely benefit but also a challenge to ensure such treatment course is appropriate. Whatever the new standard treatment protocol is for HCC is undoubtedly TACE will play the central role.